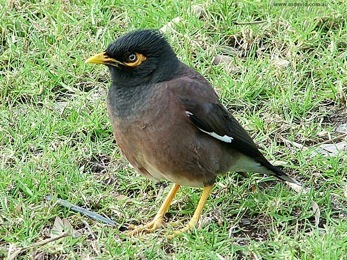 INDIAN MYNA - the flying cane toad. The World Conservation Union has included the Indian Myna in the list of the 100 most invading species in the world and they have been described as an extreme threat to Australia. - Mynas are noisy, aggressive and not afraid of humans. - During breeding season, take over nesting hollows, harassing and evicting native birds and animals which use the hollows. - Kill the chicks of other birds or destroy their eggs. - Block the entries to hollows, causing the inhabitants to die of starvation, after which they then lay their eggs in the hollow. - Can raise two broods of young every year, and spend their nights in noisy communal roosts. Indian mynas can create fire risks in buildings through making large scrappy nests in roofs from sticks and any available rubbish they find. They also hang around restaurants & cafes, walking all over the tables in search of scraps of food. They also forage in open rubbish bins - so it isn’t hard to see the potential public health risk they pose. The Canberra Indian Myna Action Group also provides extensive information on this feral pest, on their website. Click on the following links to see pages of the Myna Bird brochure, which you can print out.